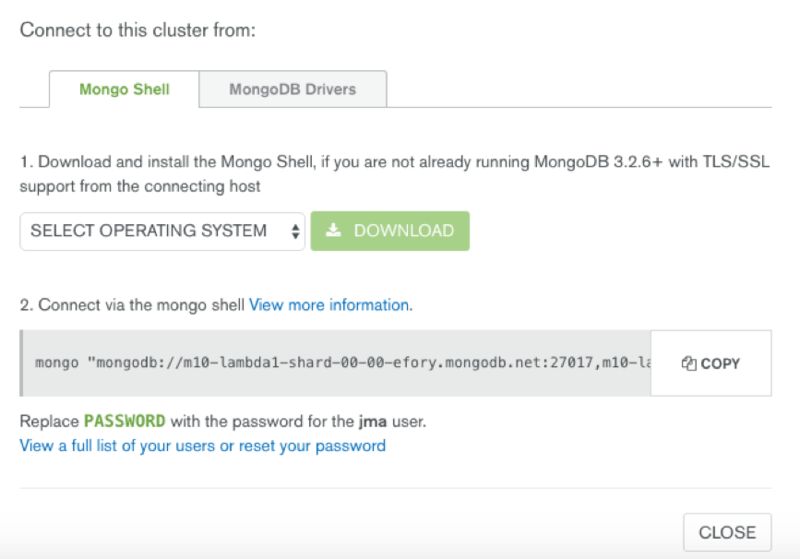 Since the inception of MongoDB, the primary interface to the database has been the mongo shell. While the shell is incredibly powerful, it can be intimidating for new users, and let's face it — there are lots of things about managing data and a database that are easier to do with a GUI. Today, we are very excited to introduce Compass v1.3, currently available in beta. Editing a document is simple - documents are modified through a powerful editing visualizer. Clicking on <img src="https://webassets.mongodb.com/_com_assets/cms/edit-lemi2ay8gf.png" class="ing-responsive" display:"inline">puts the document in edit mode. Documents can also be easily inserted into MongoDB by clicking the <img src="https://webassets.mongodb.com/_com_assets/cms/insert-m3iyasoy91.png" class="ing-responsive" display:"inline">button at the top of the document list. Clicking <img src="https://webassets.mongodb.com/_com_assets/cms/insert-m3iyasoy91.png" class="ing-responsive" display:"inline"> will open up a new window where a user can modify the contents of the document to be inserted. 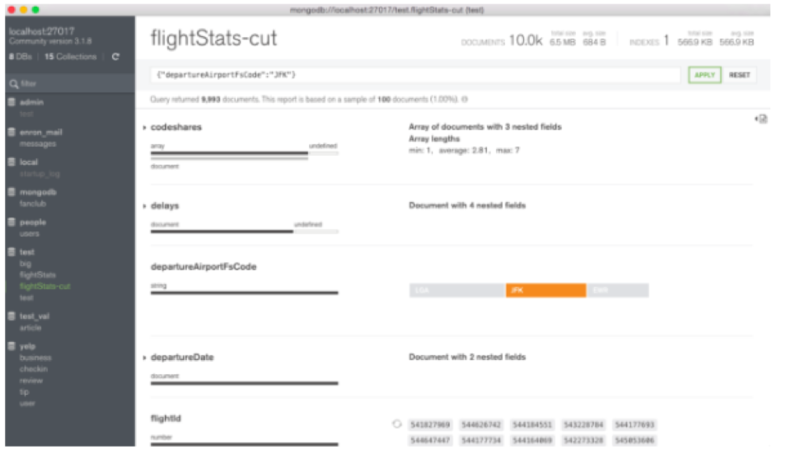 Deleting documents is straightforward as well – users can click <img src="https://webassets.mongodb.com/_com_assets/cms/trash-1dm8bkzb2s.png" class="ing-responsive" display:"inline"> at the top right corner of the document in the document list to delete a document. A document can be cloned by clicking on the clone icon <img src="https://webassets.mongodb.com/_com_assets/cms/clone-kmkofeyy5y.png" class="ing-responsive" display:"inline"> within the document. Compass will clone all the elements of the document, except for _id where a new _id will be generated. Key information about the query execution plan are highlighted. 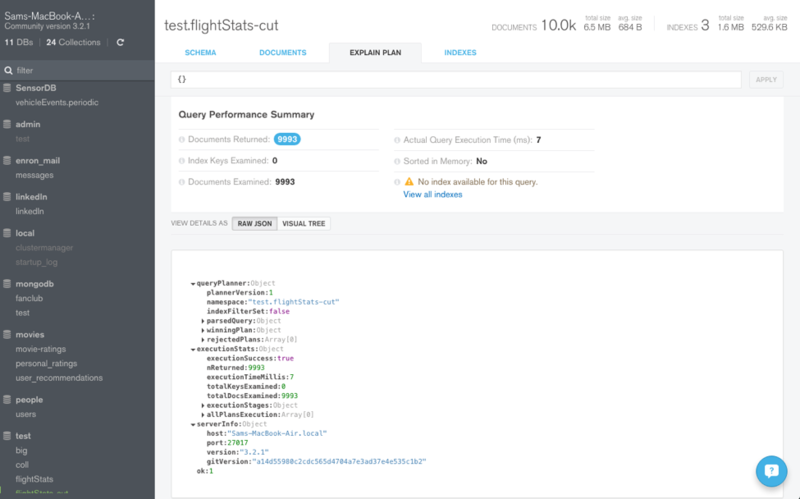 Details of each stage of the query plan can be investigated in further detail by clicking on the<img src="https://webassets.mongodb.com/_com_assets/cms/details-u37hxhche8.png" class="ing-responsive" display:"inline"> button, which provides more information about that particular stage. MongoDB Compass provides comprehensive enterprise grade security. Compass supports Kerberos, MongoDB-CR, SCRAM-SHA-1, LDAP based authentication, as well as x.509 certificates. 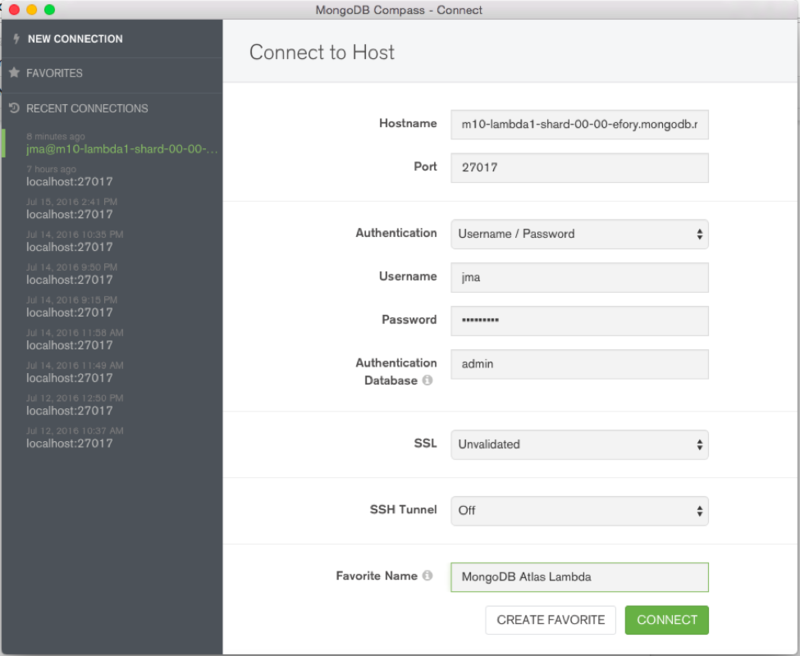 SSL/TLS encrypts data transferred “over the wire” between MongoDB and the clients. Users are also now able to connect to deployments via ssh tunnel — this is useful for connecting to production clusters when outside of the data center firewall. 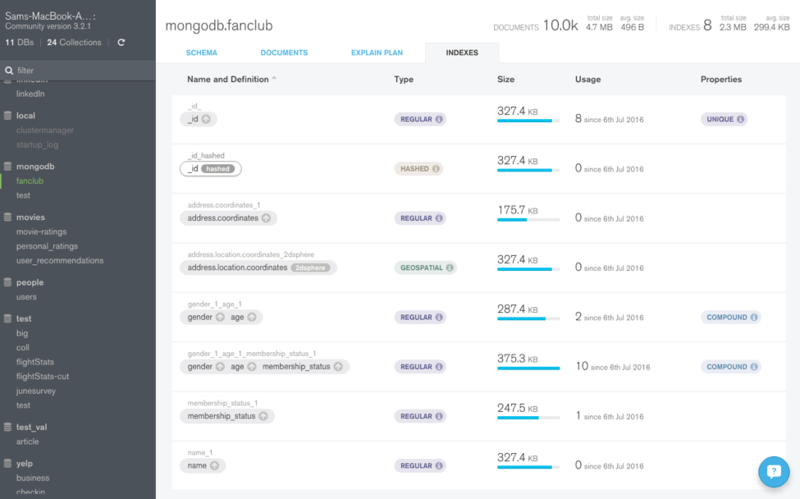 At MongoDB World 2016, we announced MongoDB Atlas, which is a database as a service. MongoDB Atlas provides all the features of the database without the heavy operational lifting. Developers no longer need to worry about provisioning, configuration, patching, upgrades, backups, and failure recovery of the database. 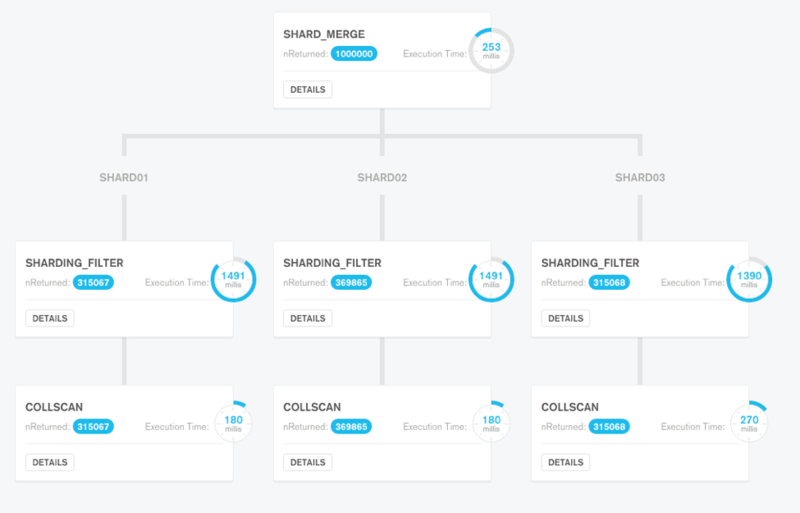 In addition, Atlas offers elastic scalability, either by scaling up on a range of instance sizes or scaling out with automatic sharding, all with no application downtime. Connecting Compass to Atlas is simple. You first need to find your MongoDB Atlas connection string. From the connection string, take the hostnames, as well as your credentials and enter in the information into the Compass login screen, and just click “CONNECT” to login. 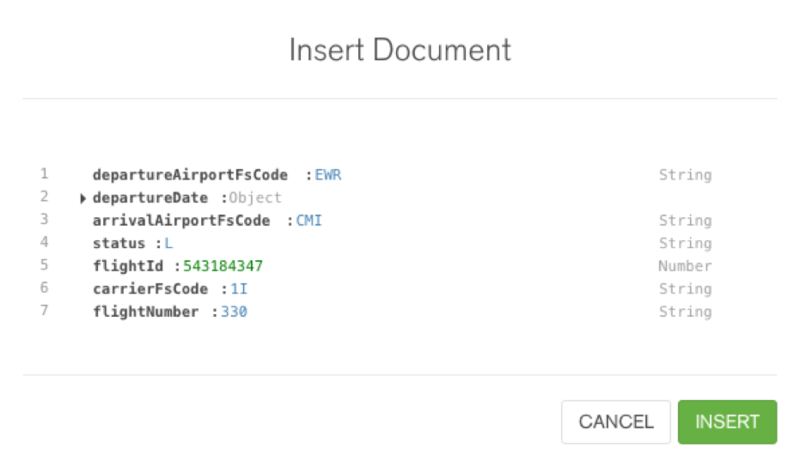 Easier Project Handoffs: MongoDB’s flexible schema and and rich document structure make it easy to build applications with any data model. Though this is empowering for developers, it may be unfamiliar for new teams picking up the project. This problem can be compounded when teams are distributed. With Compass, teams can quickly visualize and understand the organization of their data and share that with other teams to minimize uncertainty during project handoffs.